Friday, I decided it was time for another local farm adventure! I had originally planned to go to Sunizona Family Farms to pick up a FarmBox, but since they now have a delivery to the Bisbee Food Co-op on Wednesdays, I decided to wait. But, on one of my previous trips, we had noticed a pinto bean farm, so I decided to still go over and check it out, plus head to Apple Annie’s again for veggies and apples. I went with my friends, Jen and Verity, and Verity’s little guy (he’s 1 and was great the whole trip!). Thanks to Jen for driving! So, the first stop was the Bonita Bean Company. They process beans from growers in the southeastern part of Arizona. They have pinto beans in 3, 10, 25, and 50 pound bags. They also have a 9 bean mix, pinto, cranberry, light red kidney, yellow, black, small red, pink, navy and great northern beans, in 1.25, 10, and 50 pound bags. 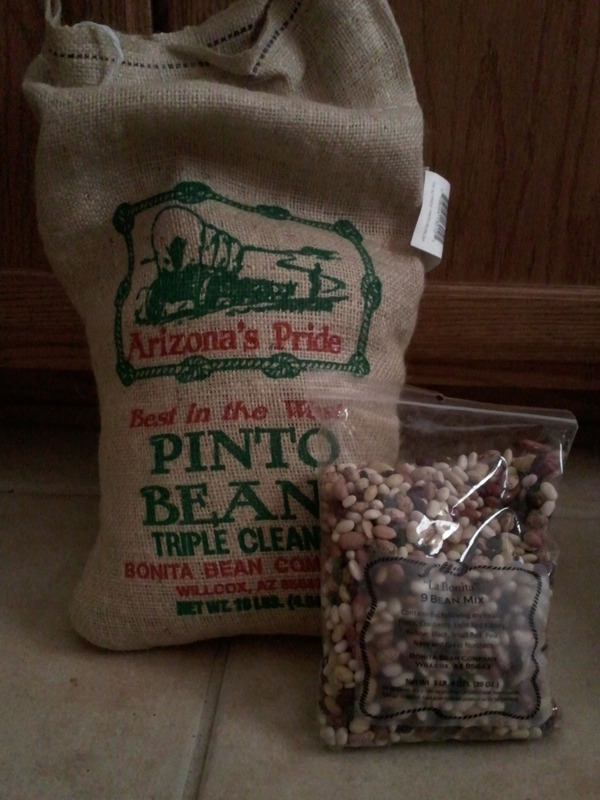 Very friendly and helpful staff there, and I decided on the 10 pound burlap bag of pinto beans and the 1.25 lb 9 bean mix. My total came to $12.50, $10 for the pinto beans, $2.50 for the 9 bean mix. Verity also bought a recipe book with lots of ideas for beans, so I should be able to make good use of all the beans. I think my first attempt will be refried beans, and we’ll see what else from there. 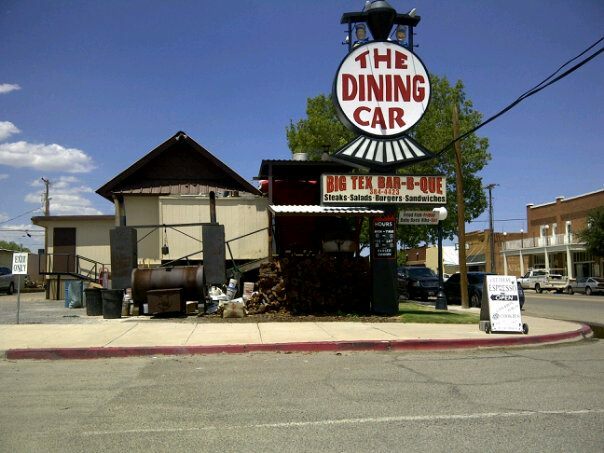 After the bean company, we headed back through Willcox to find a place to eat lunch. We decided on a cute place named Big Texas Bar-B-Que. 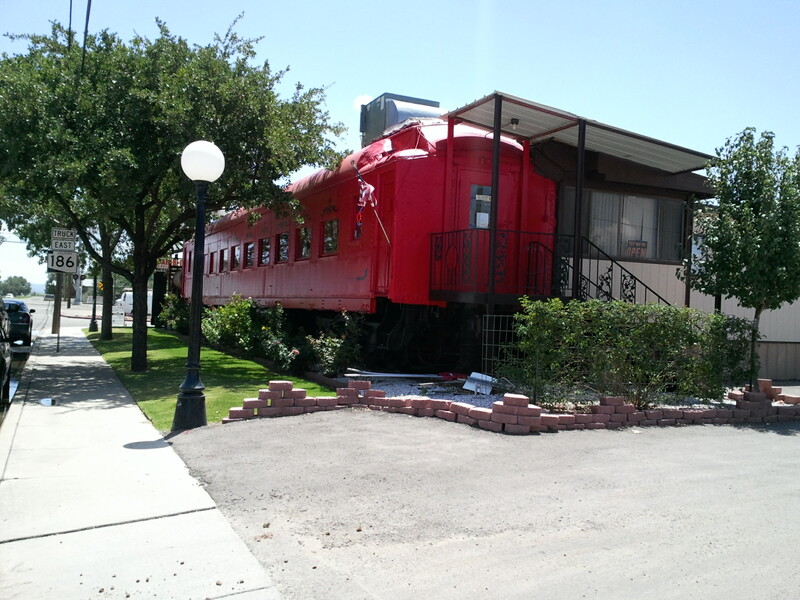 Part of their dining car is in a train car, as the restaurant is near the railroad tracks in town. They have a big smoker where they smoke their own barbecue, which we could smell immediately when we got out of the car to head inside. I had the Texas Brisket Sandwich with french fries, both of which were very good. I recommend a stop in there if you are over that way. Edited to add in more pictures, thank you to Jen! 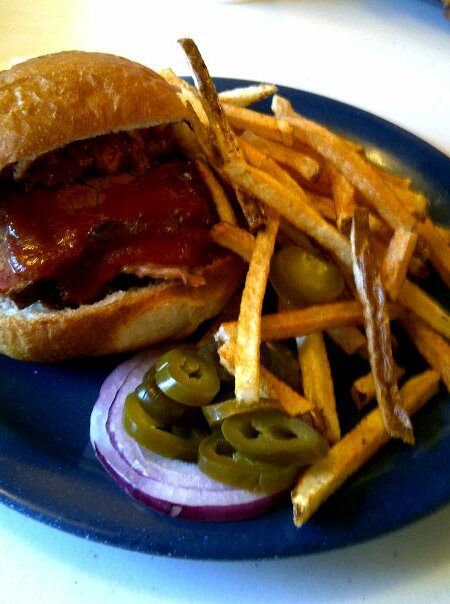 Texas Brisket Sandwich and Fries. Delicious! 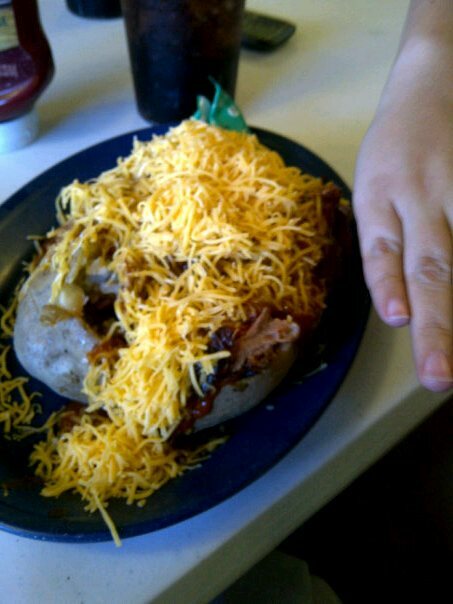 The Brisket Stuffed Baked Potato. Quite possibly the largest potato I’ve seen! Next we traveled to Apple Annie’s Produce and Pumpkins, then Apple Annie’s Orchard. They have a lot of produce available now already picked or you go out and pick. 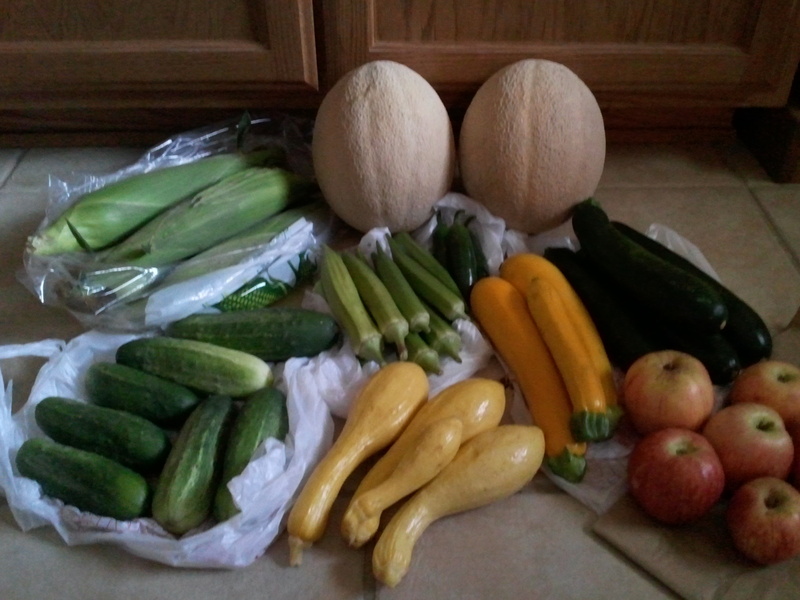 I got 1/2 dozen corn, a 5.01 lb cantaloupe, a 4.82 lb cantaloupe, 5.08 lbs of assorted squash, 2.13 lbs of cucumbers, 0.2 lbs of jalapenos, 0.82 lbs of okra, and 1.81 lbs of Gala apples for a total of $21.62. I also got some homemade fudge, which was buy 4 for $11.99, get 2 free. Delicious! I may head up that way again next month when more apples will be in season. 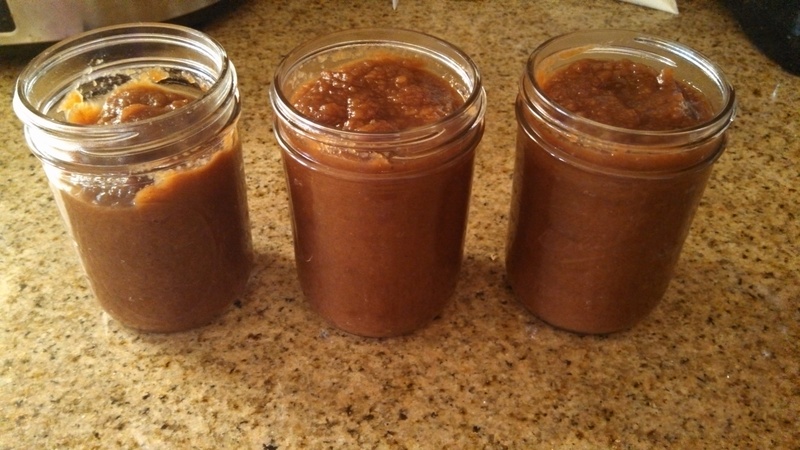 Then, I can make apple crisp, maybe make some apple juice in my juice extractor, apple sauce, and apple butter. Yum! The Apple Crisp recipe I have is one of my very favorite desserts. 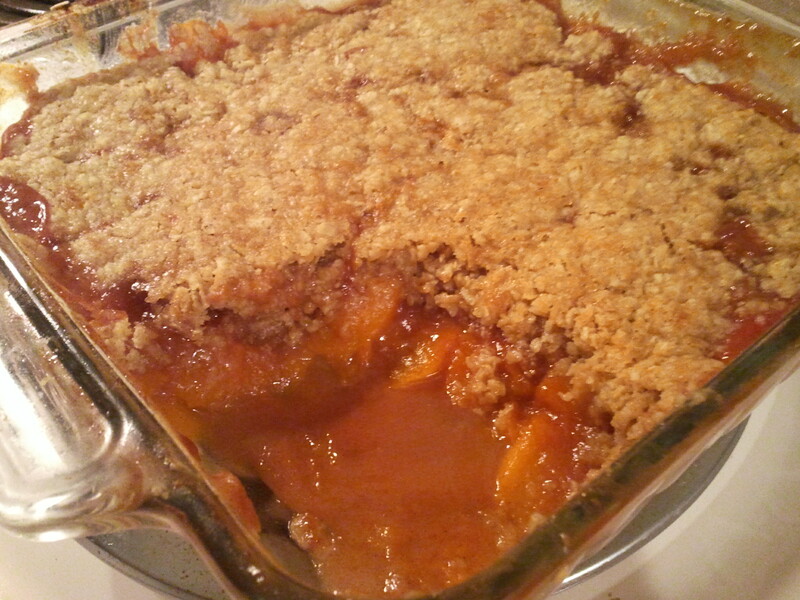 So, since I had plenty of peaches from my trip to Apple Annie’s, I decided that a Peach Crisp might be something to try. And, I was right, it was very delicious! 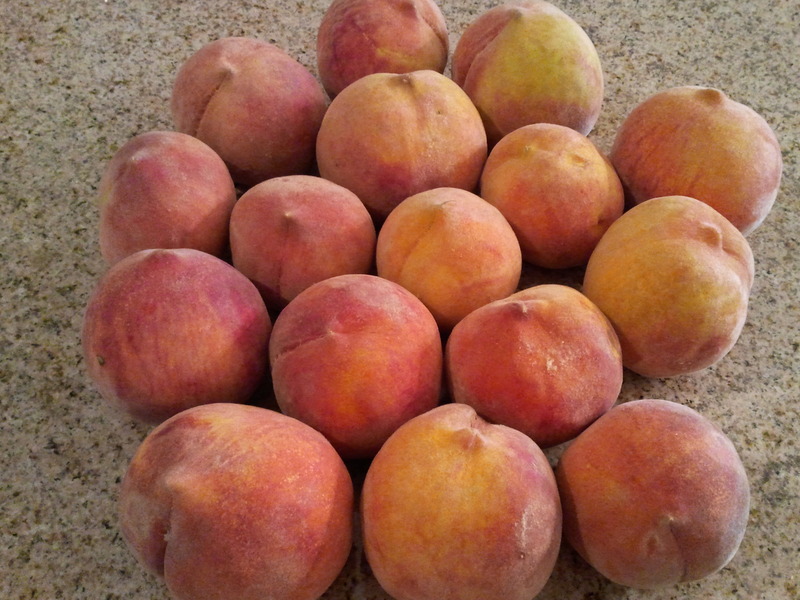 A hint on peeling peaches that I used for this recipe and also for the Peach Freezer Jam: Place peaches in boiling water for a few minutes, then remove and place in ice water. Then, the peels should slide off easily, to be ready for slicing or chopping. I have attempted to make jam before, and failed miserably. It was too sweet and didn’t set right. That was well over a year ago, so I decided it was time to attempt it again. I recently bought some canning supplies from a friend, so I was feeling better prepared, but I wasn’t able to get to the store for lids yet, so I decided on freezer jam using the Ball plastic freezer jars. 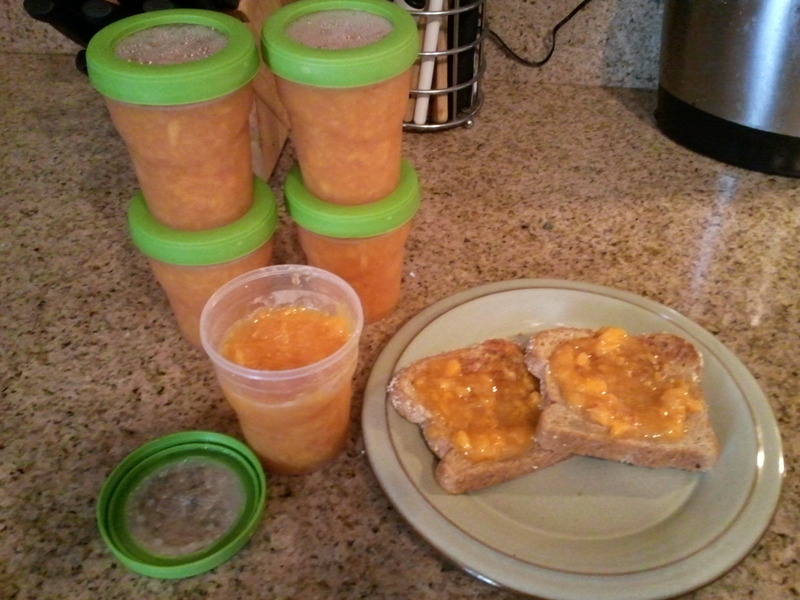 I also felt the peaches were sweet enough, so I found a no sugar needed recipe and made sure I had no sugar needed pectin. It was a pretty easy, straightforward method, and it turned out decent. It was still runnier than it should have been, so I will need to adjust the pectin for the next time. I’ve read that in time I will learn better the pectin amount, and I need a little more work, but much better than the last time I attempted jam! You may remember about a month ago, I shared a burlap sack with 5 dozen ears of sweet corn from Apple Annie’s Produce & Pumpkins with a friend. 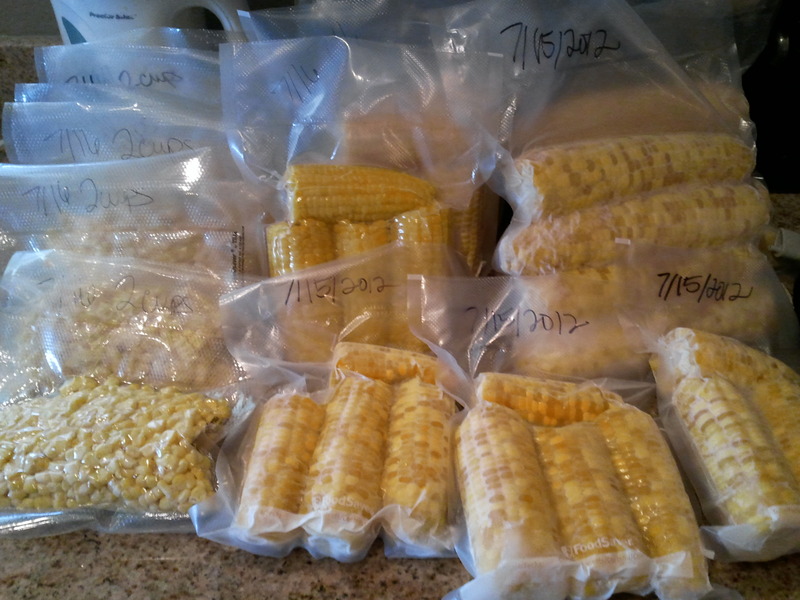 So, what did I do with 2 1/2 dozen ears of corn? First, I removed all the husks and scrubbed the ears with a vegetable brush to remove any remaining silk. Then, I blanched the corn. If you aren’t familiar with blanching, this site explains why blanching is needed and what times you need for blanching. For corn, you will want to boil it for 3-7 minutes, if you will be cutting the corn from the cob, 6-10 minutes if you will be freezing it still on the cob. After the boiling, you put it in ice water to stop it from cooking any farther. Once cool, you can cut the corn from the cob for packaging or package the whole cobs (or, in my case, I did some whole and some half cobs). I used the first of this for dinner 2 nights ago. I let it thaw, sprayed with olive oil, sprinkled with salt and pepper, then wrapped in aluminum foil. I cooked it on the grill along with some burgers, and it turned out really good. Not exactly like fresh, but still really good. I’m pleased with the corn and that the process worked. Now, we can have grilled corn all through winter, since we can still grill here in AZ almost all year! I had a medium-sized eggplant from Bountiful Baskets and a small eggplant from my trip to Apple Annie’s yesterday, and I was searching for a way to make it. I finally decided on a little twist on bruschetta. Most bruschettas that I have had, the tomato, basil, and mozzarella are cold, but I decided to make this hot and with the cheese melted. It turned out really well! 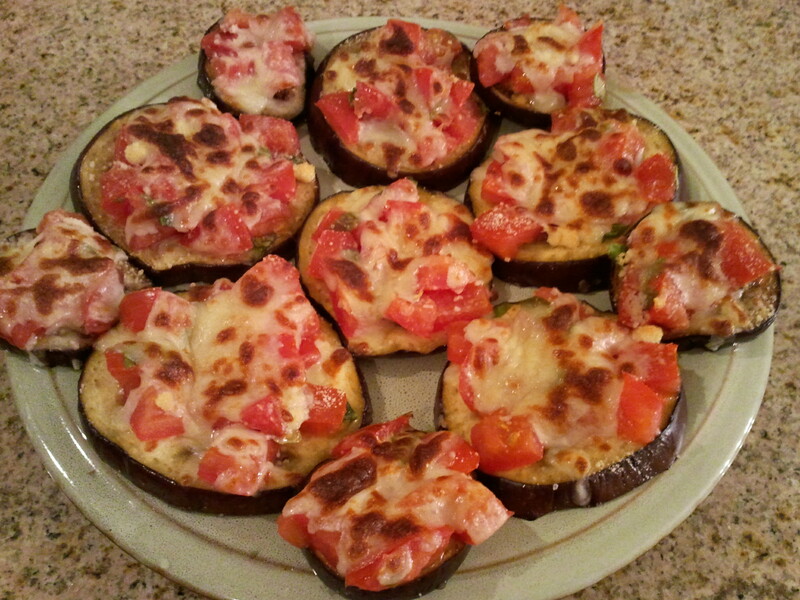 Cut the tops and ends off of eggplant and slice. Line a baking sheet with foil, and lay eggplant slices out in a single layer on the baking sheet. Brush or spray both sides of the eggplant with olive oil and season with salt to taste. Bake in the preheated oven for 10 – 15 minutes. Note: You could also grill the eggplant instead of roasting in the oven. Meanwhile, chop tomatoes, removing seeds. Mix together in a small bowl with the basil. Remove eggplant from oven and turn oven to broil. On each piece, sprinkle with Parmesan cheese, then top each piece with some of the tomato mixture. 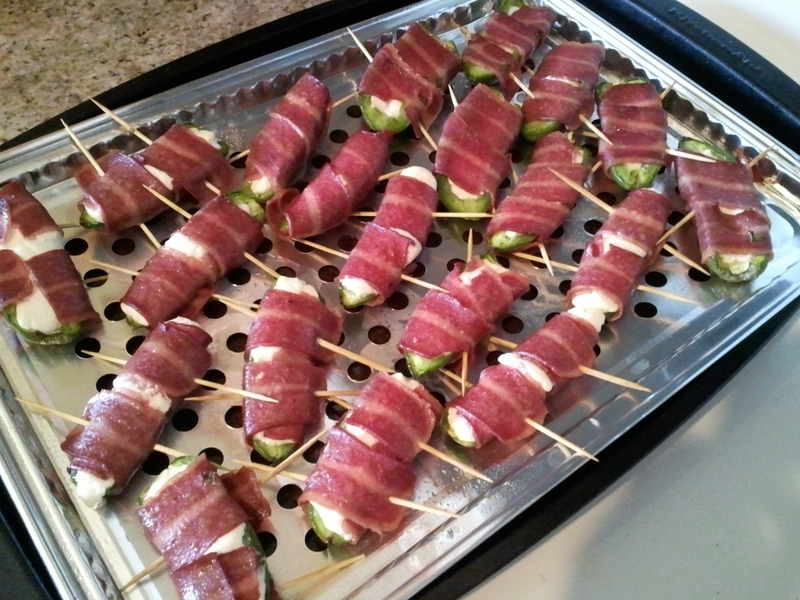 Finally, put mozzarella on each one. Place eggplant on the pan 6 inches from the broiler, and heat about 5-7 minutes until cheese is melted and slightly browned. Recently, I’ve had a strong desire to help support farms in my area. I know that farming anywhere is hard, but in the dry climate of Arizona, I’m sure it’s even harder. I already have bought from a very local farm and from our Farmer’s Market, but knew that there were more farms in our county that I wanted to see what they had to offer. Today, a friend and I set out into the “country”. Our first stop was Sunizona Family Farms. They grow a variety of vegetables, some fruits, and micro-greens that are certified organic, and what they call veganically grown. They use no animal products for growing, only plant-based materials. They provide their produce mostly to the state of Arizona, available in Whole Foods and AJ’s Fine Foods, some farmer’s markets, and also through their FarmBox program. 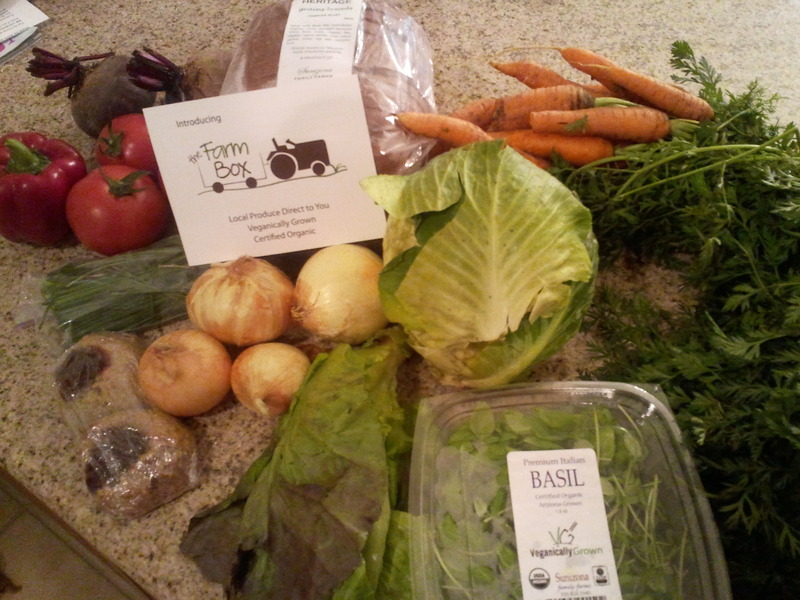 The FarmBox program is a Community Supported Agriculture (CSA) program, a way to get their product out to people. This is what I signed up for and drove out to the farm for today. They have pick up locations in Phoenix or Tucson, plus pick up at their farm. 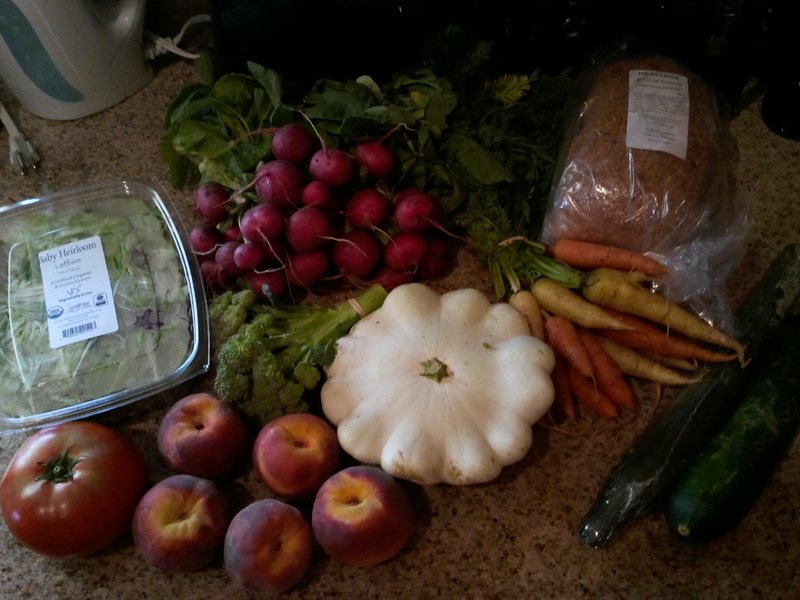 I opted to pick up at the farm so I could see that farm and to see what it would take to get a delivery to my city. I got beets, a red pepper, tomatoes (1 is missing because my husband had to try one as soon as I got home), chives, white onions, lettuce, cabbage, basil, and collard greens (which apparently didn’t make it into the picture). You can also see the thumbprint cookies, the bread, and the carrots. It all looks amazing, and I can’t wait to cook with and eat all of it. I will definitely be going back, but probably every other week because it is a bit of a drive. I also think that I will do a custom FarmBox instead, and pick what I want from the store, which I think is a great option to have. I like that the program is flexible like that, I can pick up different locations, put a hold on my subscription, change my subscription, or add-on extra things each time I get a box. 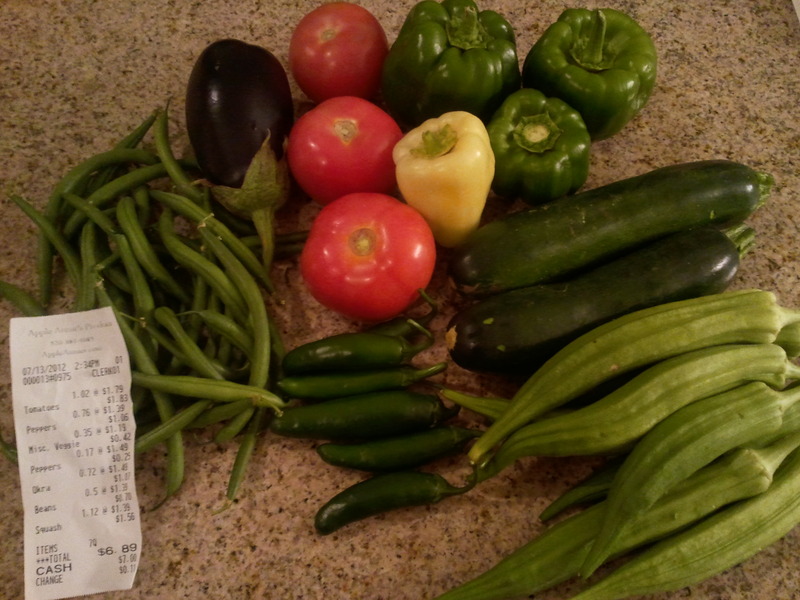 Green beans, eggplant, tomatoes, bell peppers, jalapenos, zucchini, and okra. 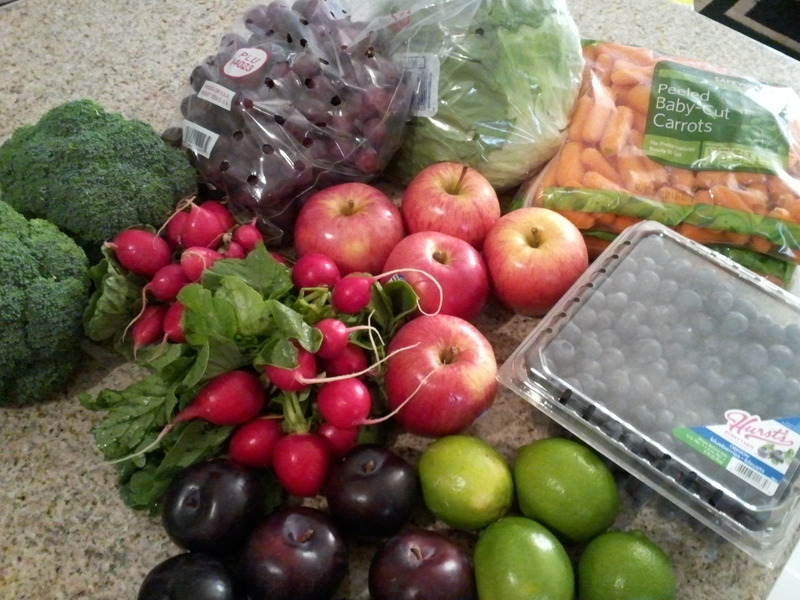 All of this cost $6.89! I was pretty impressed with that price. 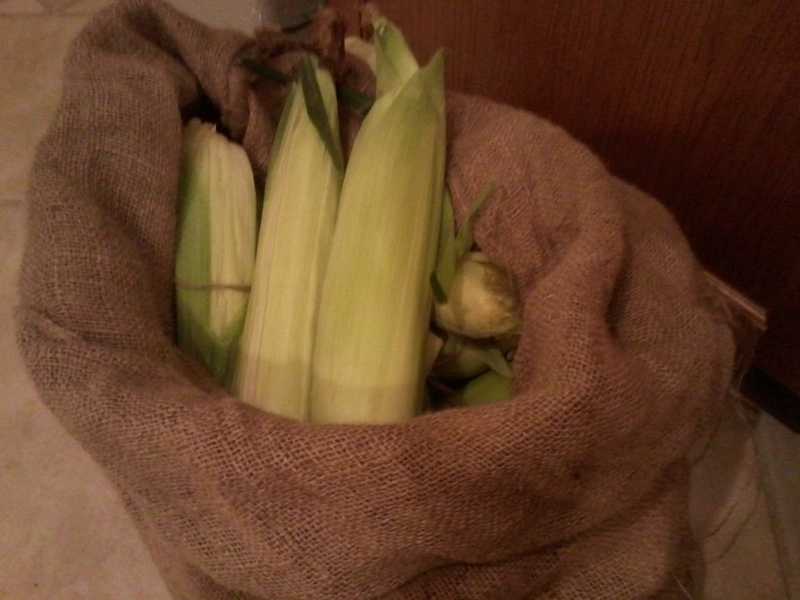 I also got 5 dozen ears of sweet corn for $26.99 to share with my friend. They also had cantaloupe, watermelon, black eye peas, yellow squash, green chiles, and cucumbers available. We had thought about stopping at the orchard as they have peaches available right now, but we’d been lucky in missing most of the rain storms in the area today and didn’t want to push our luck anymore. I have a couple other farms I want to check out, and hopefully will get to soon.